First Line: On the ferry from Hyannis to Alice Island, Amelia Loman paints her nails yellow and, while waiting for them to dry, skims her predecessor's notes. Like so many of us, A.J. Fikry's life has not gone according to plan. His most prized possession, a rare Edgar Allan Poe edition, has been stolen. His bookstore's sales are absolutely abysmal, and-- worst of all-- he lives alone. He is on a downward spiral that has only one end... until someone leaves a package for him in the bookstore that will give him the opportunity for a second chance. There's not all that much to say about this wonderful little book. There's a little something for everyone in it: humor, romance, mystery. The cast of characters is small but choice, and they don't always behave in the ways that you expect them to. 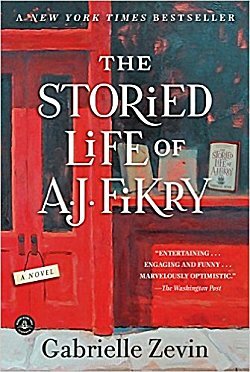 First and foremost, The Storied Life of A.J. Fikry is a paean to books and all the people who love them. It unfolds with no real surprises, but with a satisfying sweetness and grace. Emotionally, it was the perfect time for me to read this book, and I loved it. Bookstores? Rare books? Mystery? Sign me up! I think you'll enjoy it, Val!